Theodor Bergmann was tenacious in his pursuit of a military pistol contract, but the sales of the 1896 and 1897 model Bergmann pistols showed him that a single design could not effectively suit to both the military need for a powerful cartridge and the civilian demand for a small and concealable pistol. 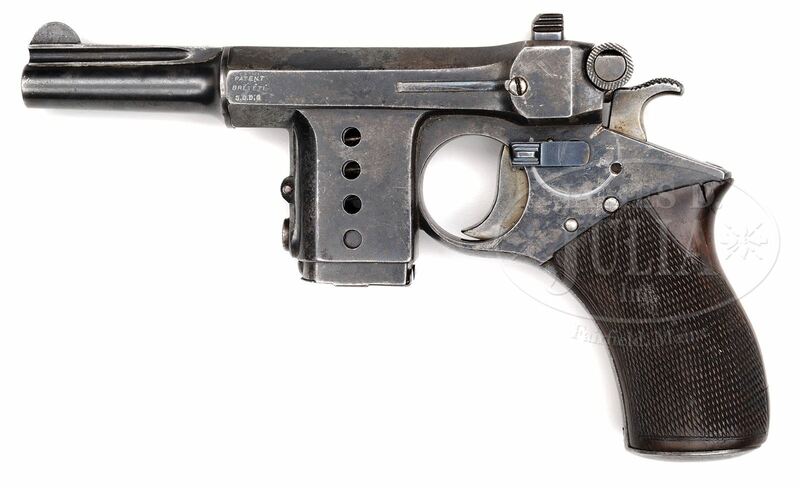 In order to pursue both parts of the market, Bergmann split his efforts, scaling down and simplifying the design into the civilian Simplex and beefing it up for the Bergmann-Mars military pistol. In order to make the Simplex smaller and less expensive, the existing locking system was scrapped in favor of a simple blowback mechanism in conjunction with a new 8mm cartridge. This round was a straight-walled 18mm long case, firing a 71 grain bullet at 790 fps (240 m/s), making it just slightly less powerful than the .32ACP. Compared to the 8mm cartridge from the No.4 1896 Bergmann, the Simplex round is 4mm shorter. The Simplex will not shoot the longer early ammunition, but it seems likely that the No.4 pistols can fire the short Simplex cartridges. Bergmann Simplex ammo made by DWM. This box (which is full) is available for sale from Simpson Ltd.
At any rate, the first few Simplex pistols were manufactured by V.C. 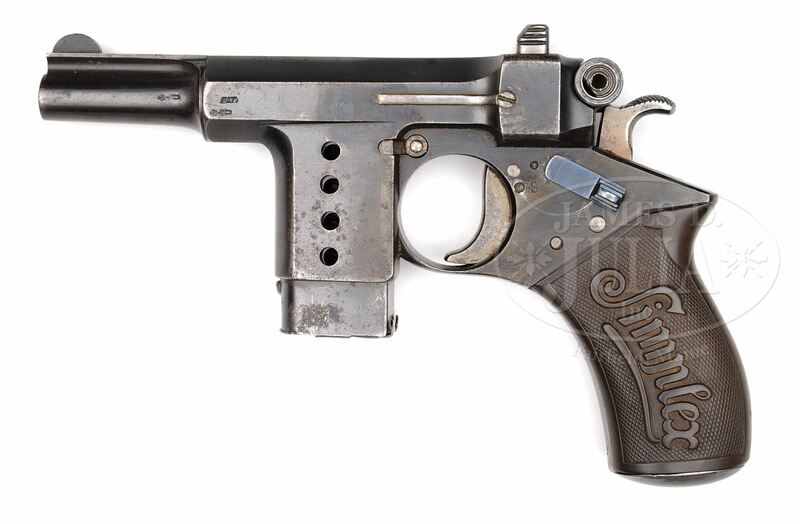 Schilling in Suhl, Germany (the same concern that manufactured earlier Bergmann pistols) but production quickly moved to Belgium. All reports from the time suggest that the low cost was made possible by the use of mediocre-quality materials and mediocre workmanship. This was a definite change for Bergmann, whose guns had previously all been of quite high quality. 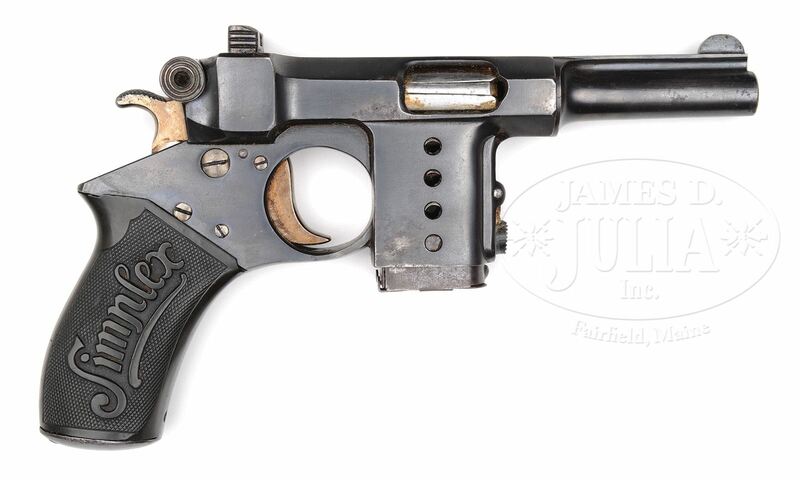 Despite this, the low price did attract buyers, and reportedly about 4,000 Simplex pistols were made. 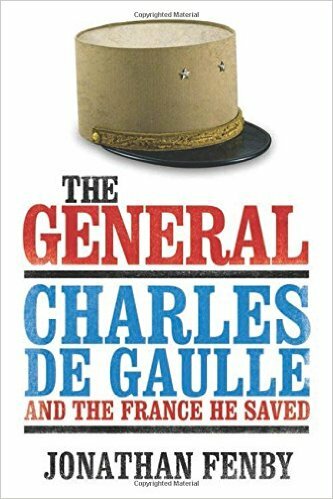 There are also reports of Spanish-made copies (thousands of them), although I have not been able to find any firsthand photos or descriptions of these copies. Ultimately, what killed sales of the Simplex was competition from the Browning/FN model 1899/1900 pistol, which set a high standard for pocket pistols of the day. Unlike previous Bergmann designs (which ejected out the top), the Simplex had an ejection port on the right side of the frame, and did use an extractor. 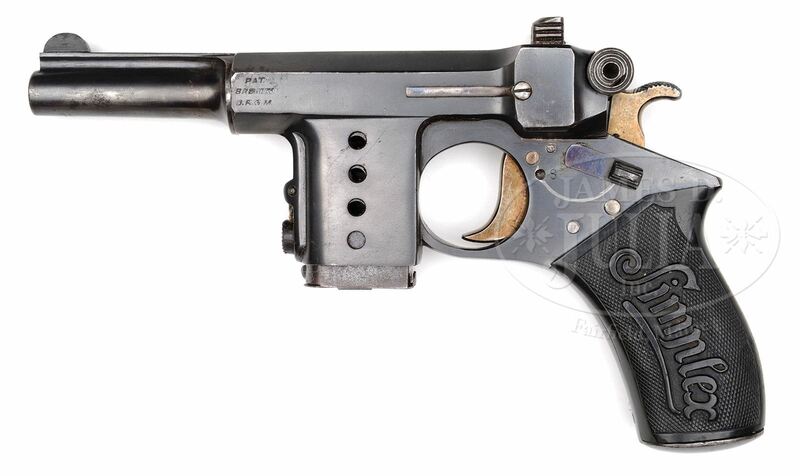 It had a fixed barrel (3.5 inches / 89mm long) and fixed sights, and a manual safety lever on the left side of the frame. Magazines were of a double-stack design, and held 5 rounds, although larger 8- and 10-round magazines were also made. As with the 1897 pistols, the magazines and frames had matching witness holes, so the shooter could see how many cartridges were left in the gun without removing the magazine. The standard 5-round magazine had 3 witness holes but the frames all appear to have been made with 4 holes, suggesting that extended magazines were planned from the beginning, and not an afterthought or third-party product. The safety on the Simplex was well designed and easy to use. Rubberized grips with the “Simplex” logo quickly became standard. Note the extended magazine, making use of the fourth witness hole in the frame. Nice. Back to the blowback operation but with a bigger bullet… Yet again I would hate to try mugging a guy brandishing one of these back in the day. Any performance figures (like wood thickness penetration)? Wow, the difference in the shaping and details of the gun are quite different between the early and later models. A interesting looking gun for the collector today but even at the time, it couldn’t have been the most practical thing about. ll noted Simplex pistols, was proofed in Germany, wery few were proofed in Belgum, but nothing indicated that they were made there. Another says that some weremade in Spain, but no proof ofthat either has surfaced. looks like the two early guns both have the magazine release on the front of the magazine well, while the late gun has it moved to a cross push button release behind the magazine well, more like we’re accustomed to today, is this the case? Thanks for this series o the Bergman’s btw. It is a design that I had only ever glanced at in the past. It would have been an interesting time in firearms development. I guess ideas had to be tried some worked others didn’t. considering the semi auto pistol starteod around the 1890’s the ideas that worked well had pretty much been sorted in 20 years. The 1911 is still around and it’s slightly improved baby the Browning Hi Power is basically the design of every locked breech pistol even today. I had a 1910 and 1922 Browning pistol in .32 ACP. In my mind the 1910 is still an excellent design and its smooth lines hard to beat. One more week – we have to push onward to the ones that actually saw military use! Andrew Chern has made a very good point about comparative anti-material performance for both the “long” and “short” ( Simplex ) 8mm cartridges. The penetration capabilities in solid pine wood for the “long” cartridge as fired from the 1896 No.4 Bergmann were quite impressive, especially considering its vintage and published muzzle velocity figures, which seemed to belie its real-world performance. Established performance criteria for the Simplex round, if available, would be most interesting. It would be interesting – I don’t have any of the penetration data, though. Caliber: 7,65mm*, Muzzle velocity: 325m/s Muzzle energy: 30,7kgm**. After calculation the energy is ~301J and bullet weight ~5,699g (i.e. ~88,34 grains). It’s comparable to .32-20 Winchester – http://en.wikipedia.org/wiki/.32-20_Winchester – states that .32-20 have 309J muzzle energy with 85 grain bullet. -have device utilizing friction to slow down slide. -have 6 or 10 ammo capacity. ** unit used to measure energy before SI system. -both are blowback with friction (slight) slide slow-down. Mannlicher have fixed magazine in grip unlike Bergmann removable in front of trigger. Thanks, Daweo! That was very good and educational information. 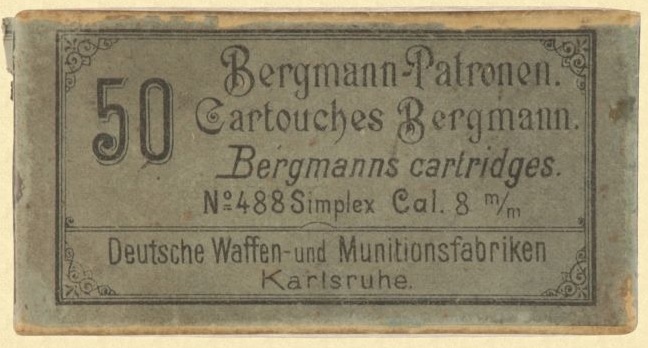 In English measures, the 7.65 Bergmann Simplex load launched an 88-grain .30 cal. FMJ at 1,066 FPS. This yields an ME of 222 FPE. This would be roughly equivalent to the “outdoor” or “rifle” loading of the .32-20 Winchester of the same era, which was not supposed to be used in handguns due to pressure considerations. According to General Julian S. Hatcher’s formula for penetration (quoted in Pistols, Revolvers and Ammunition (1972) by Josserand & Stevenson), this would give the Bergmann round a “baffle-box” result of about 9 to 10 “planks” (“1 x 8″ pine, which of course are actually 7/8” thick, or about 22mm). 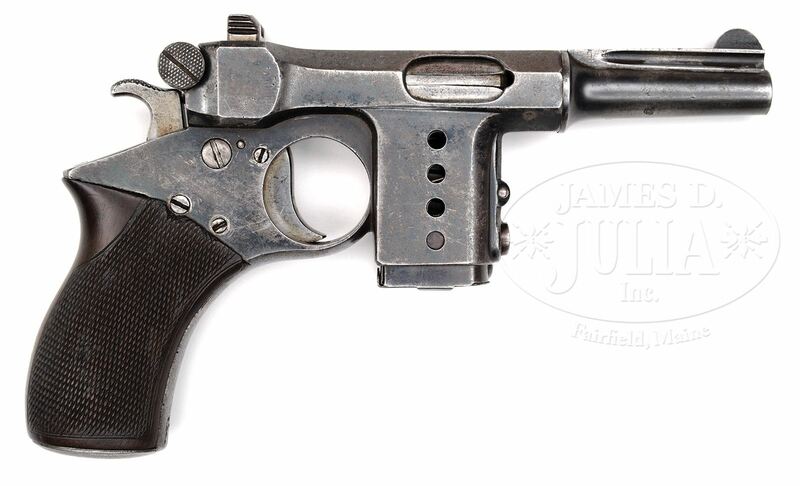 This puts it in the same category as the 7.65 Parabellum and 7.65 MAS (French “7.65 Longue” as used in the MAS M1935A and ’35S pistols). If the velocity figures are valid, the Bergmann Simplex was a real “pocket rocket” even by modern standards. Loaded with expanding bullets, it would still be a serious defensive pistol today. 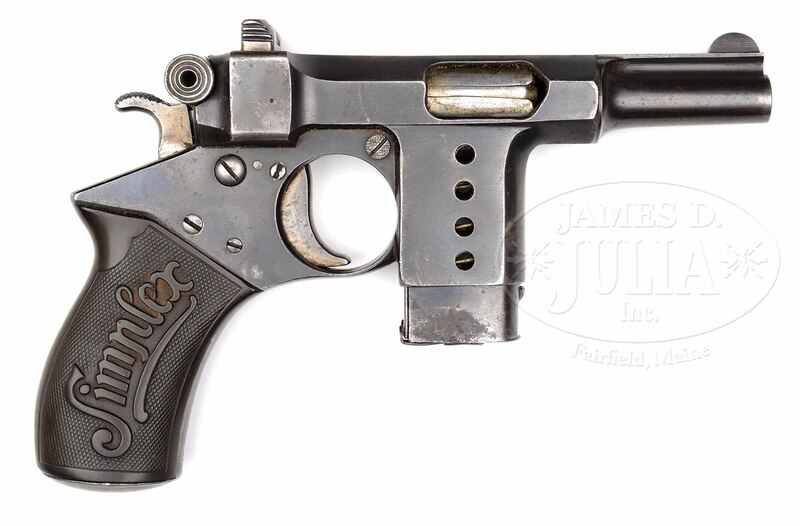 I assume this would be much better than a Derringer, for the Bergmann Simplex has some serious penetrative power. Expect some typical revolver-or-knife-wielding mugger to wish he hadn’t attacked a guy with one of these babies during the Gilded Age. The mugger would have been perforated right through his clothes. A steel plate under the mugger’s coat wouldn’t help here… Though the Man Without a Name would have survived since he doesn’t mug people. I think those numbers are from a different Bergmann cartridge. The Simplex was a simple blowback mechanism, and Wilson has some pretty specific ballistic info. He says it was 71gr at 790 fps – made by DWM under the catalog number 488. Hmm. That yields 98 FPE according to my calculator. This puts it in the same ballpark as the .32 S&W Long or .32 Colt New Police, trailing about 100 FPS behind the .32 ACP. Going back to Hatcher’s formula, this works out to 3.75 “baffles”, or about 3 planks and stuck in the fourth one. Sounds weak, until you consider that penetrating an inch of softwood requires about the same “work” (KE) as penetrating four to six inches of flesh or muscle tissue. On that basis, I’d estimate the Simplex bullet would reach the vitals of an opponent from most angles. Granted, it’s going to make a small hole, but I don’t especially like even small holes in my innards. Hatcher’s formula don’t consider bullet type. .32 S&W Long and other revolver cartridge of this era have a advantage of LRN or LFN bullet which deform easier that FMJ, therefore the FMJ can have greater penetration depth but less stopping power. Can Bergmann Simplex use cartridges with bullet other than FMJ without reliability loss? How high was pressure in .32-20 “rifle” loading? It can’t be used in any revolver of early 20 century or earlier or in only particular revolver? For example if we have Colt Single Action Army or Colt 1878 the wall will be .126″ thicker in .32-20 than in .45 Long Colt. Here we get to the confusing part. The .32-20 was loaded at two different power levels from its beginnings, a “medium-velocity” load for revolvers and a “high-velocity” load for rifles. 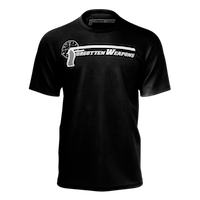 The medium-velocity load originally launched a 80-grain LRN at about 900 FPS, and the “high-velocity” or “outdoor” load was the same bullet weight at 1,066. SAAMI pressure limits on the rifle loading are 30,000 PSI piezo and 28,000 copper crusher. Pistol loads are roughly 75% of the lower figure. The thing is, this works out to about 1,200-1,300 FPS with the 100-grain bullet in the rifle load and 1,050 with the same bullet in the pistol load. Which, coincidentally(?) are the standard loadings for both types manufactured by U.S. ammunition makers, going back to at least the mid-1970s, according to (among other things) the ammunition listings in Gun Digest, etc., from the period. http://en.wikipedia.org/wiki/.32-20_Winchester states that .32-20 was introduced in 1882, the smokeless powder was first used in Lebel rifle in 1886 so .32-20 has original black powder loading moreover 20 grains of smokeless powder in so small case is too many. BTW The cartridges names are sometimes very confusing. For example where .327 Federal have .327″? at very beginning era of these kind of firearms. direct the split away from shooter, to the side. various places, and sometimes to the face of shooter. Schmeisser remedy; providing an extractor. possible harm to the shooter. highest level of gas pressure inside chamber occurs. Schmeisser remedy; obtaining a breechbolt lock action. “Mars” which is the nearly the strongest one ever made. by lock piece on “Mars”.